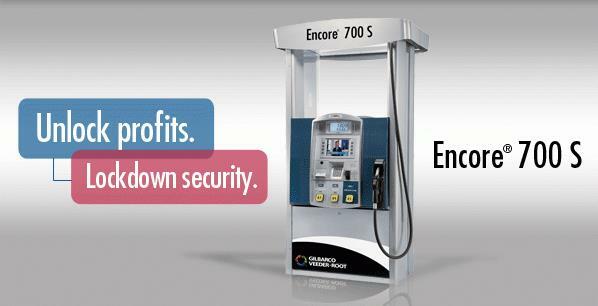 Encore 700 S Gas Dispenser | CSESCO INC. Secure your competitive advantage and increase profits with Gilbarco syour best gas dispenser investment for today and tomorrow. Highly secure, these Gilbarco gas pumps with powerful CRIND® electronics build a flexible and innovative platform for your changing forecourt marketing and payment needs. Enjoy peace of mind with a leading foundation that is highly secure today and upgradeable to meet the payment and technology needs of tomorrow. Proven Applause™ forecourt merchandising to drive in store traffic. Enhanced security. And a global electronics platform that supports emerging technologies. It’s a smart investment that gives you a competitive advantage. Enhanced, upgradeable security protects your investment. *Based on known EMV specifications today. The US EMV specifications have not yet been announced. Platform for growth delights consumers.